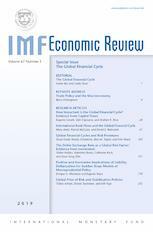 As the official research journal of the International Monetary Fund, IMF Economic Review presents articles that offer a high-level view of economics, including such topics as Macroeconomic implications of financial crises; Economic and financial spillovers; Policy responses to crises; Fiscal policy and stabilization; Policy responses to commodity price movements; and Monetary and macroprudential policies. IMF Economic Review applies rigorous analysis with an empirical orientation that benefits readers and engages with a broad audience, including academics and policymakers. The journal borrows from, and interacts with, related fields: international trade, political economy, labor, economic history and development. A selection of articles on international banking and liquidity risk transmission are free to view until 31st October. Stay up to date on events, announcements and new releases.